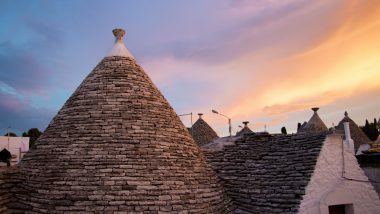 Puglia, hidden in the boot of Italy’s heel, is an emerging region that’s ideal as a road trip destination. 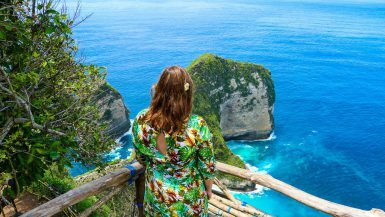 If you are looking to spend some quality sun-drenched time on phenomenal beaches and in beautiful cities, look no further. 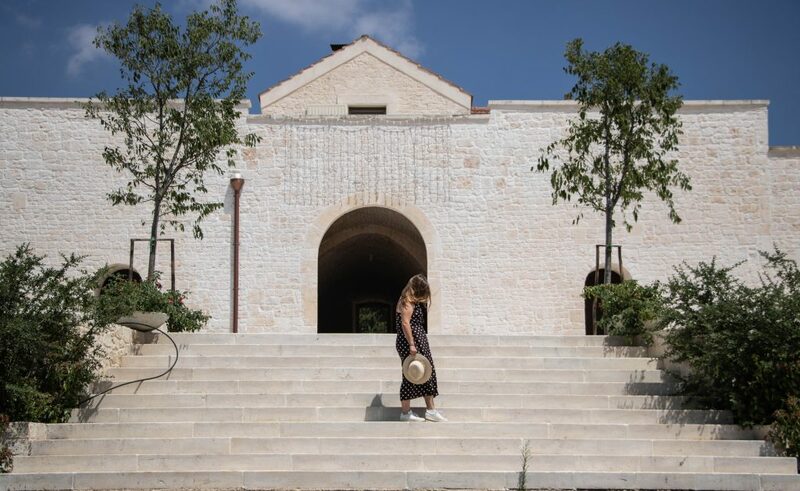 If you do not have a driver’s license, don’t fret – there are good train connections in Puglia, so you can still explore this region pretty well. 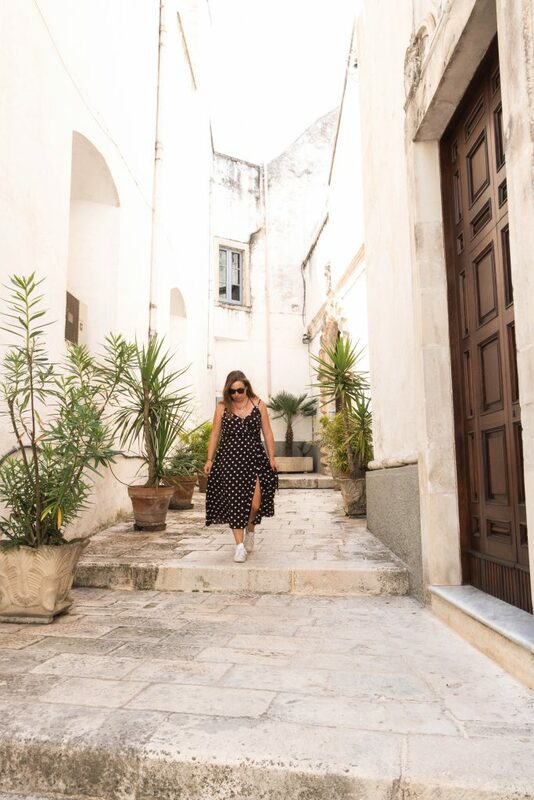 We visited Puglia at the end of July and it was very hot. There were also quite a lot of (Italian) tourists as the countrymen themselves were on leave. In my opinion, the months of May, June, September or October may have been better for a visit. Beautiful weather and some quiet… sounds like a wonderful combination in my books! 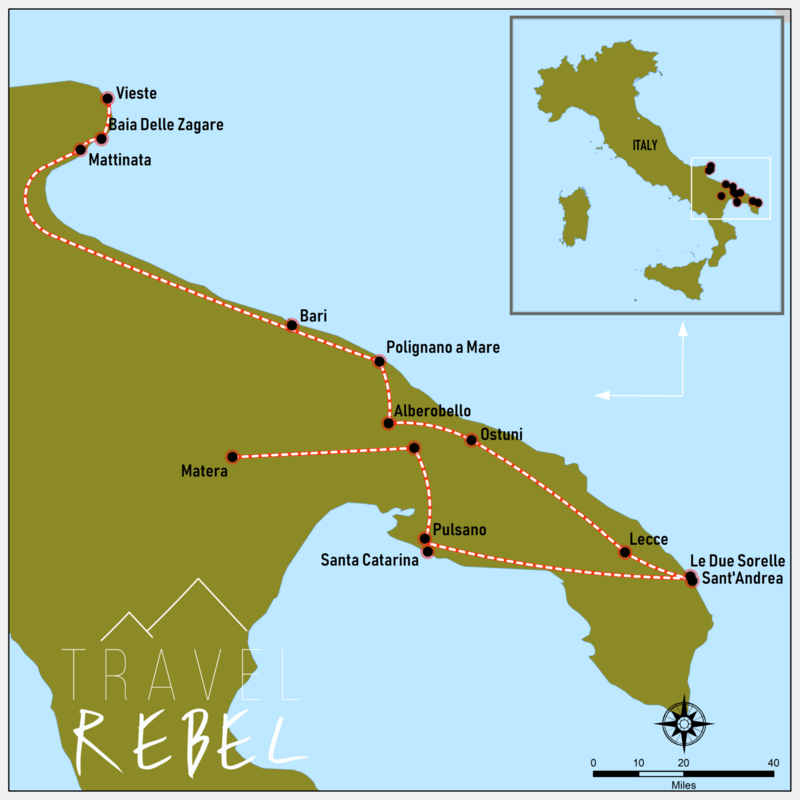 Since we drove from the middle of Italy to the south, Vieste was the first on our route. 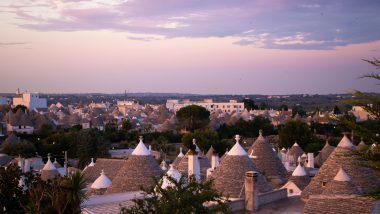 This is also one of our favorites in Puglia. Vieste is a part of the Gargano Peninsula. 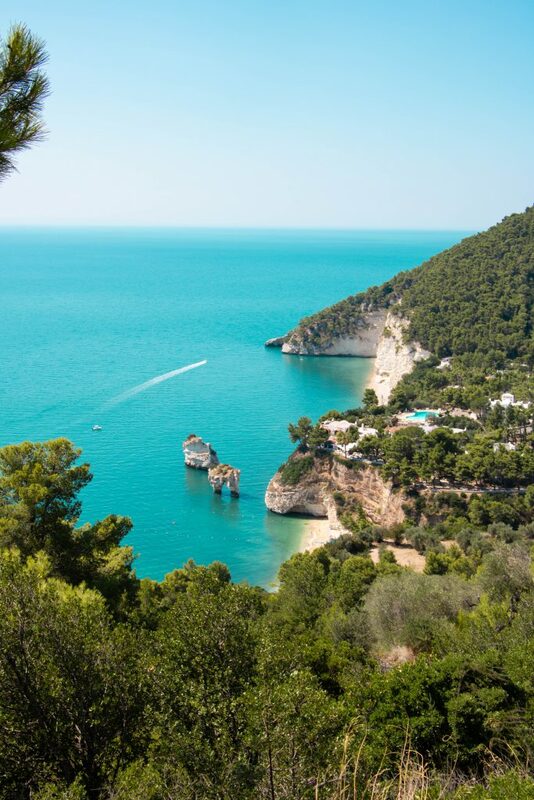 Most of the upland area of this peninsula is actually a part of the Gargano National Park, one of the 24 national parks in Italy. Needless to say, the beautiful rough landscape is stunning. 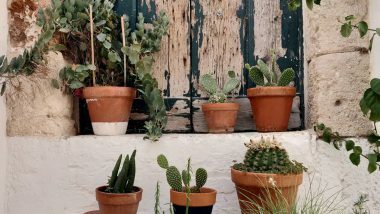 It is dotted with countless olive trees, cacti and pine trees and enjoys the backdrop of the Adriatic Coast. Oh, it’s also known as the track of the Italian heel and you can be sure to enjoy the sultry sea breeze running through your hair. The history buffs will find the Italian trabucco, an ancient fishing machine, quite fascinating (pictured below) here. You can be soft &nd successful, A traditionalist &nd a rebel, A lover &nd a fighter, Vulnerable & invincible. 🐚 You can see a traditional trabucco in this picture. You may have travelled your whole life but nowhere else in the world you will be able to witness this traditional way of fishing. The trabucco of San Lorenzo is a centuries-old traditional fishing machine &nd it arose from the need to keep fishing during unpredictable &nd violent sea storms. Even if you have traveled all your life, I am pretty sure you would not have seen this kind of fishing set-up anywhere. The trabucco of San Lorenzo is an age-old traditional machine that was created because of the need to continue fishing even during violent storms. Don’t miss out on some authentic seafood while you’re in the area. The restaurants near the edge of the sea are quite appealing, as is the idea of spending a day at the beach. The Pizzomunno, a beautiful white rock on the beach, also can’t (and shouldn’t) be missed! Do note, however, that once it’s dark, you can encounter some unique things in the forest. For instance, a bunch of bats flew around our car for quite some time. Cows and goats often run across the streets during the day, but fortunately, you can usually hear them because of the loud cowbells (still, it’s a bit unnerving when so many of them stare at you during a nightly car ride). Some of the most beautiful beaches in all of Italy are near Vieste, such as Baia delle Zagare and the beach of Mattinata (or la farfalla bianca, the white butterfly). These are perhaps the most famous Italian song lyrics of all time, from Domenico Modugno’s worldwide hit. 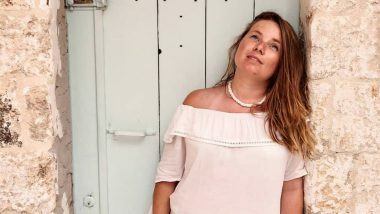 What a lot of people don’t know is that inspiration behind the ‘blu’ from this song was not just the eyes of a girl… it was also the blue sea of Puglia! You see, Modugno was born in 1928 in the beautiful coastal town of Polignano a Mare. In fact, in the village, there is a three-meter high statue of its most famous inhabitant. 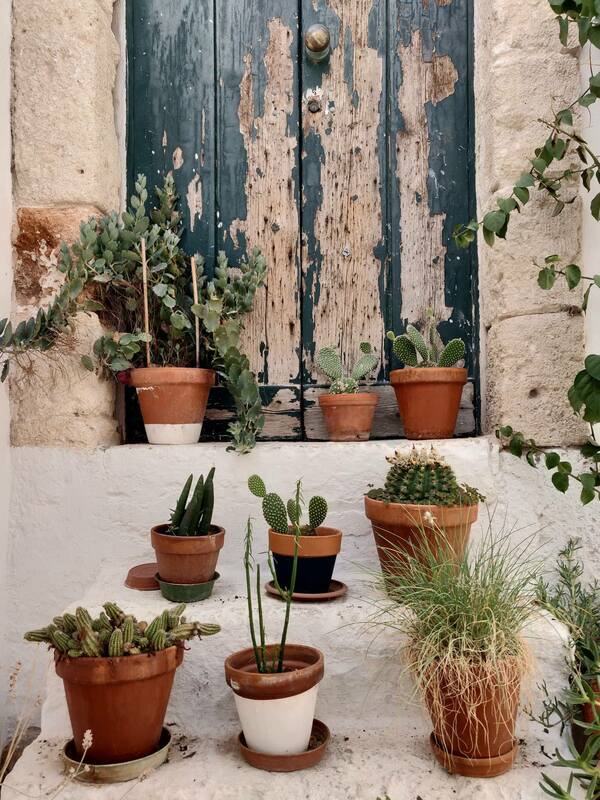 But Polignano is so much more than just the birthplace of Domenico. 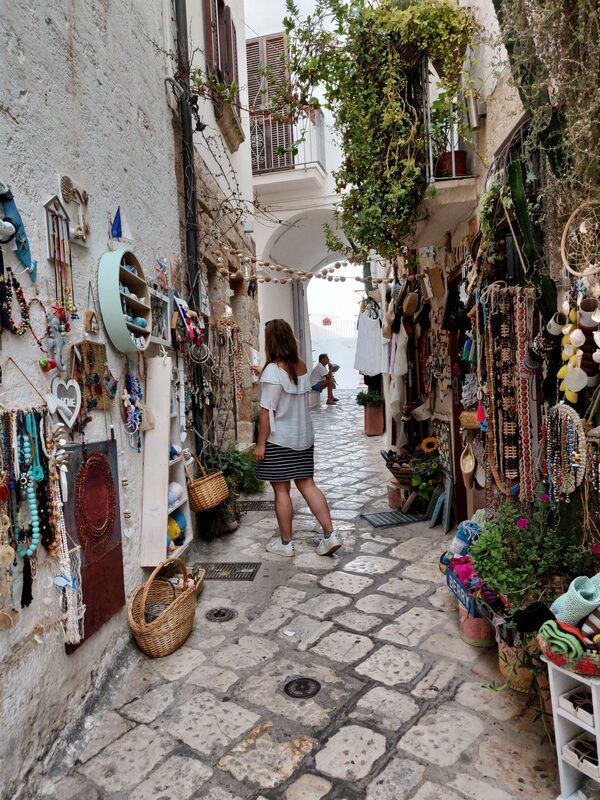 It is a Pinterest/Instagram worthy town with lots of charming white streets, pastel-coloured window shutters and quaint terraces. 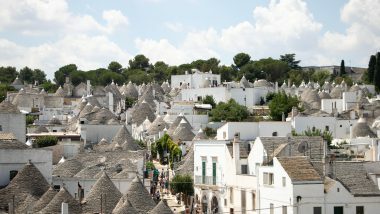 Alberobello, known as the trulli village, is a UNESCO world heritage. We went strolling through the streets during sunset, which is the ideal time to visit this place. 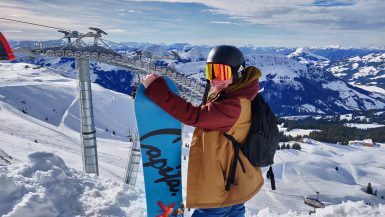 It’s not a hidden gem and quite known to the general public, so don’t get caught up in the tourist traps and more expensive menus. 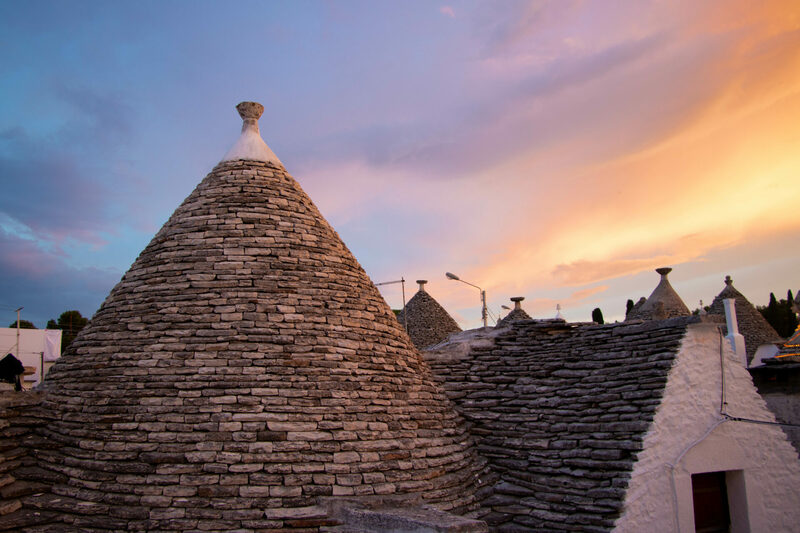 We ate fantastic and cheap food at Trullo del Conte near the church, check that out if you can. We slept at a beautiful agriturismo called Paretano. This is a gigantic renovated riding school with a beautiful location and an infinity pool. 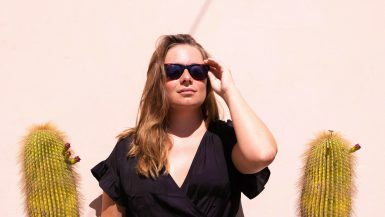 You can also easily book via Booking.com (if you have not booked with this site before, you can get a 10% discount via this link). 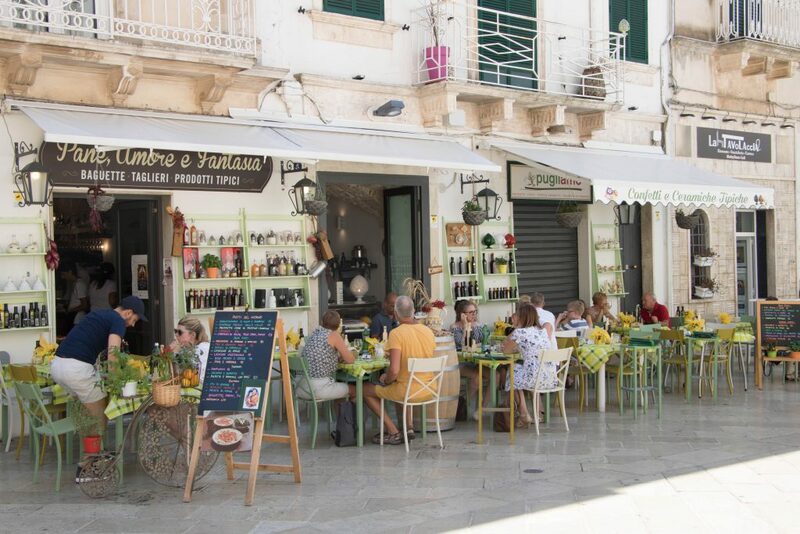 A nice stopover for lunch was Martina Franca, an idyllic white village with narrow alleys and beautiful squares where you can wander around on foot because the historic center is completely car-free. The town definitely boasts an artistic touch and you can see quotes from Picasso everywhere. 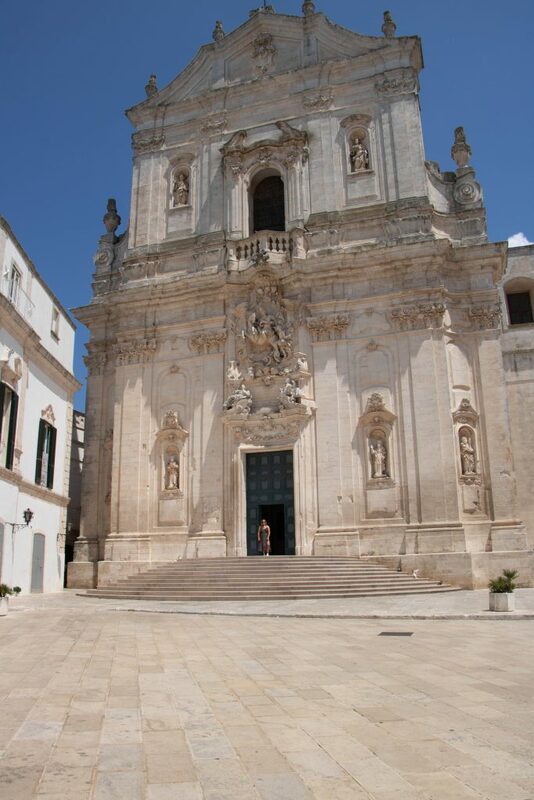 We saw our first Italian wedding (yup, in practially every city in Puglia, we saw a wedding). We ate delicious, healthy salads at Pane, Amore e Fantasia. 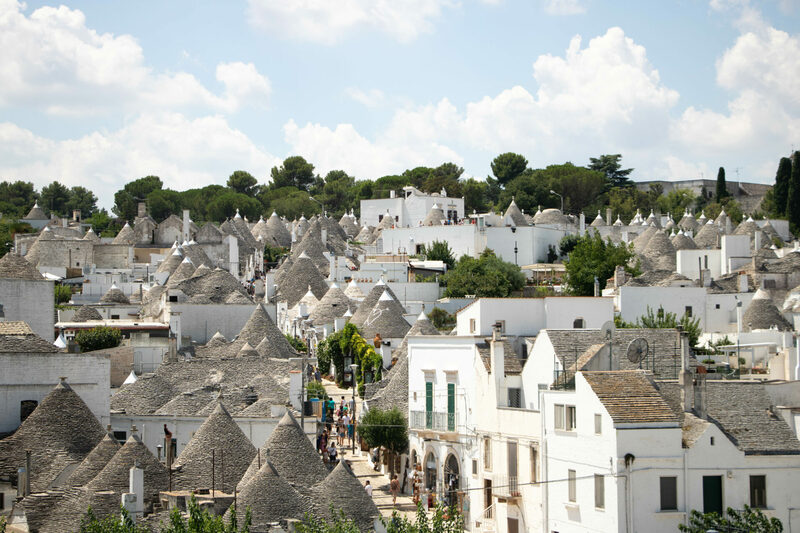 Ostuni, also known as Citta Bianca, is another Pinterest worthy tourist attraction. 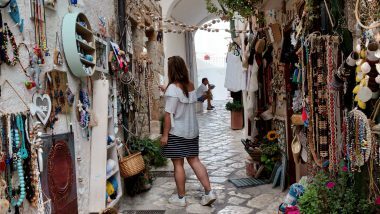 We bought the typical artisan sandals and wandered through the sweltering streets. 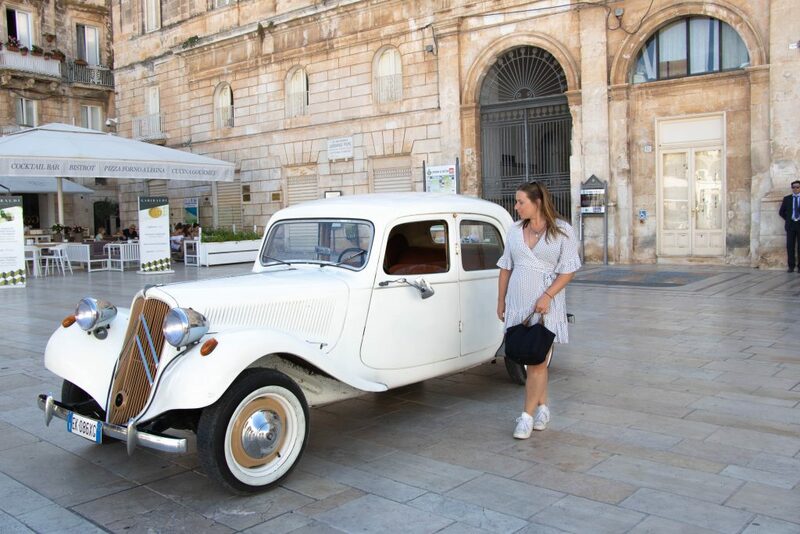 After Ostuni, we drove in the direction of The Maladives of Salento, which proved to be a hugely over-hyped beach destination with noisy fairground attractions, crowds, and neon lights. Out of necessity, we had to spend a night here, but left early in the morning for better places. We also made a stop at a small beach Terremoto and took advantage of the warm water and beach before continuing onward. 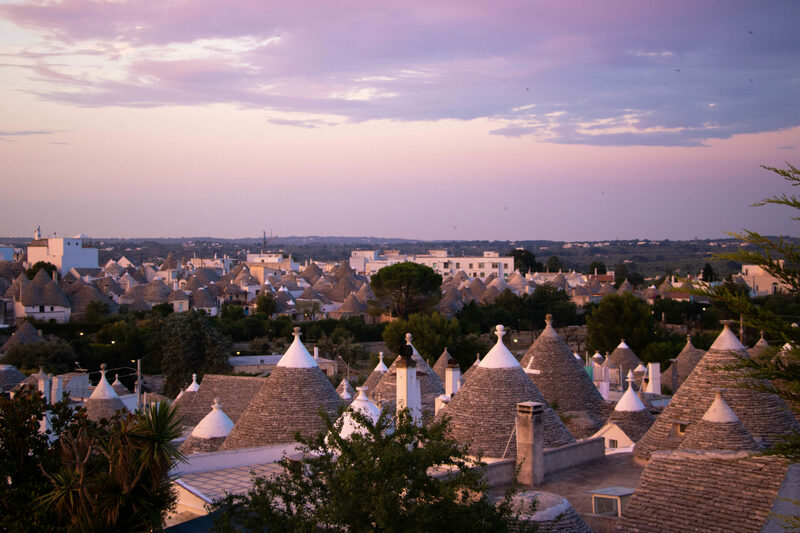 And that’s enough sharing for today… but I am definitely not done with this account of our Puglia adventures. So lookout for part II, coming shortly. Until then, have fun planning your very own Italian road trip!